Fall is here (or should I say Winter?)! When it starts raining and snowing it seems we are ready to get back to our sewing, sit by the fire and snuggling in our quilts. We have some new patterns and classes you are sure to love! Star Pincushion - October 3, 2013 @ 6:30 pm- Come spend the evening making a creative pincushion. Stargello- November 16, 2013 @ 9:00 am- Using the Jewel Box Gem Thirty Tool (Required for class). The samples for each of the classes will be available to view sometime in the next week. Which came first, the chicken or the egg? 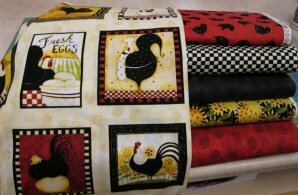 This is the cutest chicken fabric!